This page started on 18 Mar 2013. It will be under construction for a while. I started finding people from Sant'Eufemia who had immigrated to Australia many years ago. Now I've found enough that I thought I should make a web page summarizing what I've found. They are all in my giant SEaM family tree. First were Pantalone descendants. They are on my Pantalone web page. Then came Palmieri descendants. They are on my Palmieri web page. Hi all. My name is Diane Rogers (nee Deltondo). I'm originally from McKees Rocks PA. My grandfather, Pietro (Peter) Deltondo was born in Sant'Eufemia. I'm relatively new to the genealogy game and my activities have been mostly limited to Ancestry.com. So far, the trails go cold as soon as I trace a branch to Europe. Any suggestions or references that you can throw my way would be appreciated. I'm trying to find out more about my great-grandparents - Raffaele and Dominica (DiNardo) Deltondo. There's a story that Raffaele came to the U.S. in the late 1800s with 2 friends - Filippo Pantalone and Michele Fattore. The 3 are said to have committed a crime and spent some time in jail. Michele Fattore died during this time and Raffaele kept a promise to his friend by returning to Italy to marry his widow Dominica DiNardo. I can't help but wonder what crime was involved. Like Mark, my Sant'Eufemia branch has an Australian connection. My grandfather's siblings settled there and "the Australian cousins" get to the U.S. from time to time and make the rounds. I hope everyone had a great Thanksgiving holiday and I'm looking forward to learning more about Sant'Eufemia. Working with Diane "DeeMarie71 aol.com"over the past two years, we found out a lot about her family. We found diNardo, Mancini, Crivelli, Colafella and Fattore surnames. Her grandfather, Pietro delTondo, had at least two siblings, Maria (who moved to Australia) and Ernestina. Maria married Giuseppe Carapellotti, also from SEaM. When we started looking at Maria and Guiseppe, Diane told me about an email she received from Jilna Hatton who lives in Perth, Western Australia. Jilna's step-brother is Peter (Carapellotti) Hendrie. Peter is a grandson of Giuseppe Carapellotti. Australia and lived in Broken Hill. It was the Carrapellotti family that we are mainly interested in finding/tracing more info from. If you are able to help out we would appreciate it very much. I live in Perth, Western Australia. Where abouts do you live? I was pointed to your tree on ancestry.com by Diane del Tondo Rogers. We have been working together tracing her grandfather, Pietro del Tondo. Diane had already done a lot of work and I added a few pieces. I've copied Diane on this email. Diane forwarded an old email from you that described your connection, via your step-brother, to this tree. We also found another large (but still unrelated) branch of del Tondo in Western Pennsylvania. That is where I grew up, the small town of Aliquippa which is about 20 miles northwest of Pittsburgh. My sister still lives in the family home there. I live near San Diego, California. I have a bunch of Palmieri cousins who live outside of Melbourne. They came to US to visit some of their newly found cousins a few years ago. I got to meet them on their trip. That family was also connected to the Carapellotti family through Filomena Carapellotti (1854-1919). My GGM is Maria Nicola Carapellotti (b 1845). I looked though my data but I cannot (yet) connect Giuseppe Carapelloti to his parents or siblings. Of course, Sant'Eufemia is such a small town that everyone from there is related one way or another. I expect my genealogy will be an on going project till the lights go out and my plan is to eventually have a complete family tree of everyone from Sant'Eufemia. A big job. It was so lovely to hear from you. I will be in contact with my brother Peter who lives in Tasmania, Australia tomorrow,and will pass on this info. He is very interested to find more history on his side of the the tree hence the search. It was a few years ago that he found a step sister connected to him and was so delighted to hear from her. It was great to be able to get him connected to other members of his family also who live in Melbourne. He has made 2 trips to Italy and visited Sant`Eufemia as well, and has learnt how to speak Italian as well. He is thinking about another trip to look for more info, but has not planned a holiday as yet. I`m sure he would be very interested to hear from you Mark, as you may be able to shed more light for him. Please keep in contact, and if I can help you in any way please let me know. 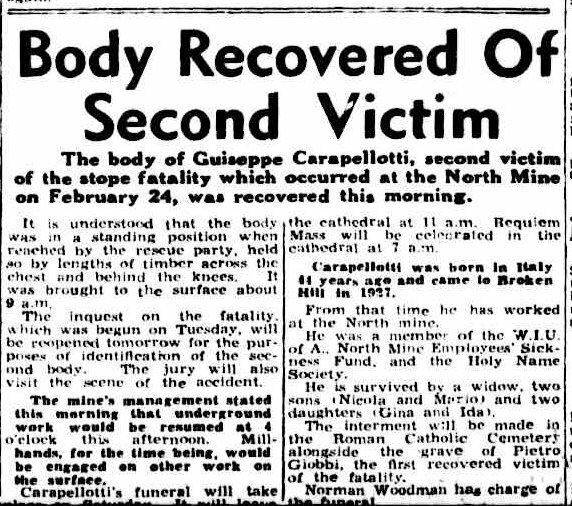 I learned from Jilna that Giuseppe Carapellotti had been killed in a 1949 mine accident at a mine in Broken Hill. She has a family tree on ancestry.com. 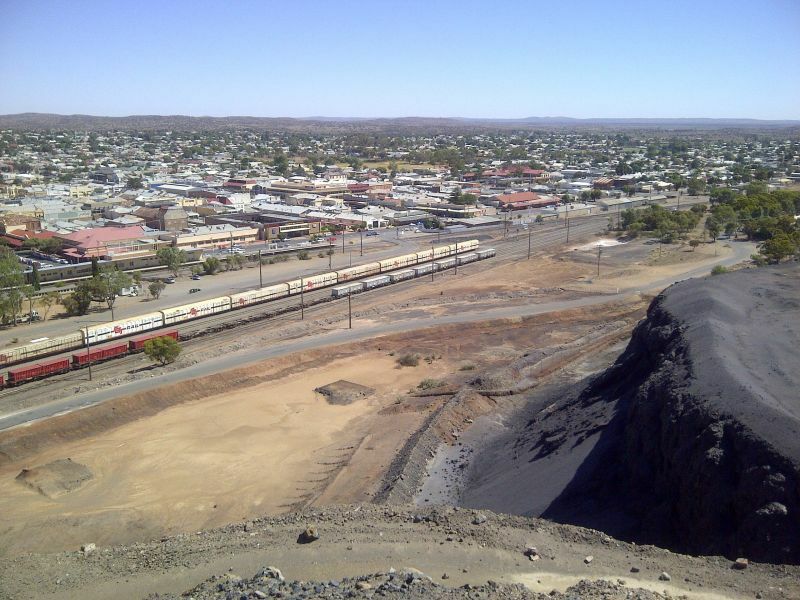 "Google is your friend" - searching there, I found the Broken Hill newspaper, "The Barrier Mine" on-line. It had several articles about the mine accident that killed two men; Giuseppe and Pietro Giobbi. The accident occured on 24 Feb 1949. There are articles starting in the 25 Feb issue of the newspaper. The bodies of the two men killed were not found for several weeks. 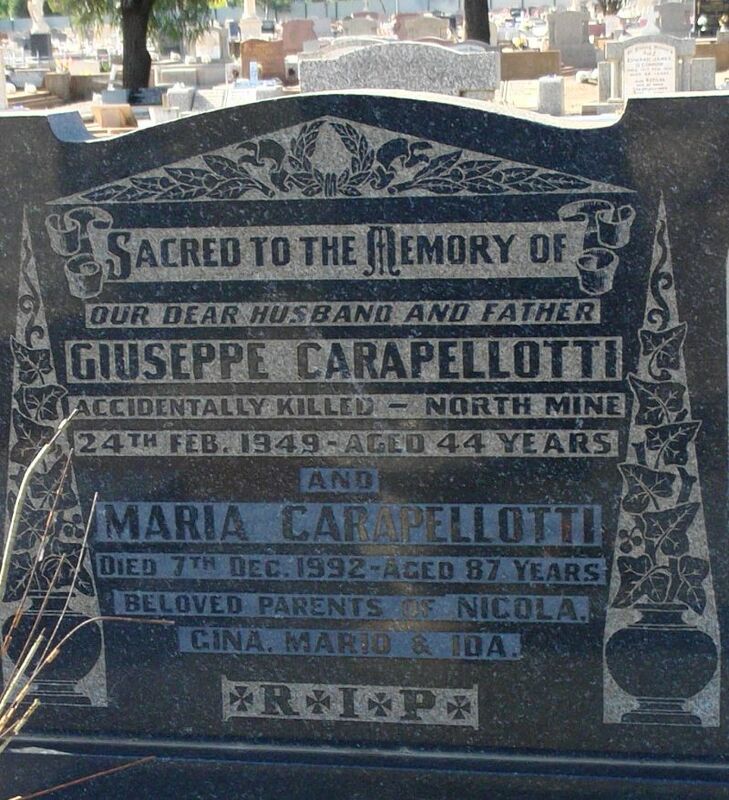 Here is a photo of Giuseppe and Maria Carapellotti's tombstone at Broken Hill Cenetery. It is from Jilna's family tree on ancestry. I recalled that one of the Palmieri cousins married into the Giobbi family. I emailed my cousins in Melbourne to ask about the Giobbi connection. 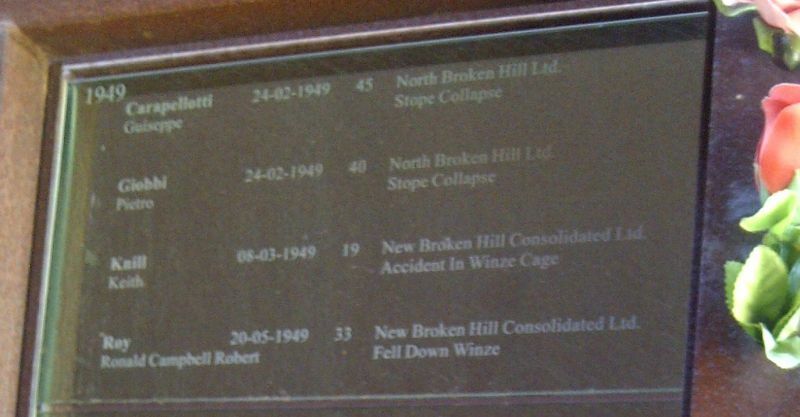 I know your families are connected to Broken Hill sometime in the past. I've been working with a del Tondo from Sant'Eufemia and we traced cousins to Broken Hill. The family is Maria del Tondo and her husband, Giuseppe Carapellotti. Giuseppe was killed, along with Pietro Giobbi, in a mine accident in 1949. Giuseppe had four children, Nicola, Gina Maria, Mario, and Ida. How amazing! Angela has told me about this incident and mailed me information. I have it here. 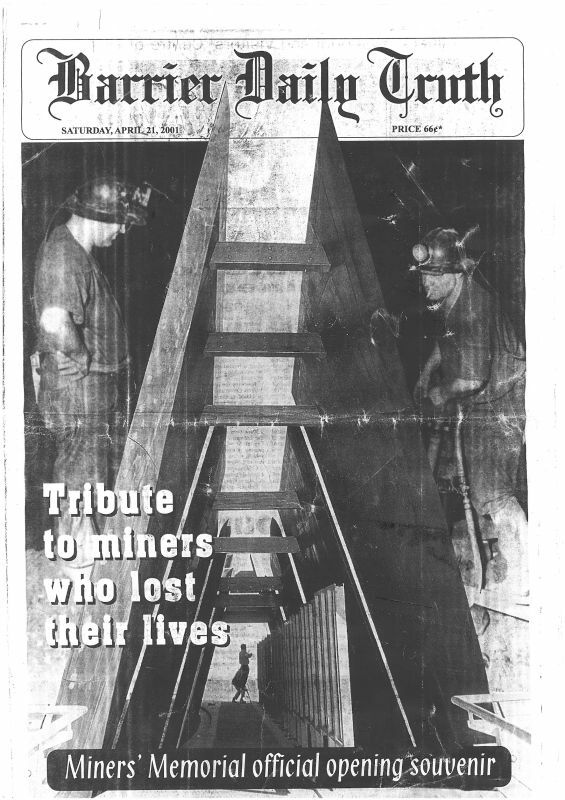 It is a 2001 Newspaper Souvenir tribute article to the miners who lost their lives. The name Del Tondo rings a bell as Mr & Mrs Luigi Del Tondo appear on some documentation from Angela's Grandfather, Amato, requesting he be enrolled as a Perpetual member in the Franciscan Mass League. Angela sent me some photos taken by her husband, John, in Jan of 2013. John is a direct descendant from the Pietro Giobbi who was killed in 1949. These photos are of the memorial built at the mine site that honors the men killed over years of operation. Giuseppe Carapellotti and Pietro Giobbi names on the memorial. Pietro was my father-in-law. The miners were killed in 1949. Only 12 months ago, they found one of my father-in-law's boots. The del Tondo's live in Melbourne, Adam, my cousin, could tell you about them. We left Melbourne 34 years ago. 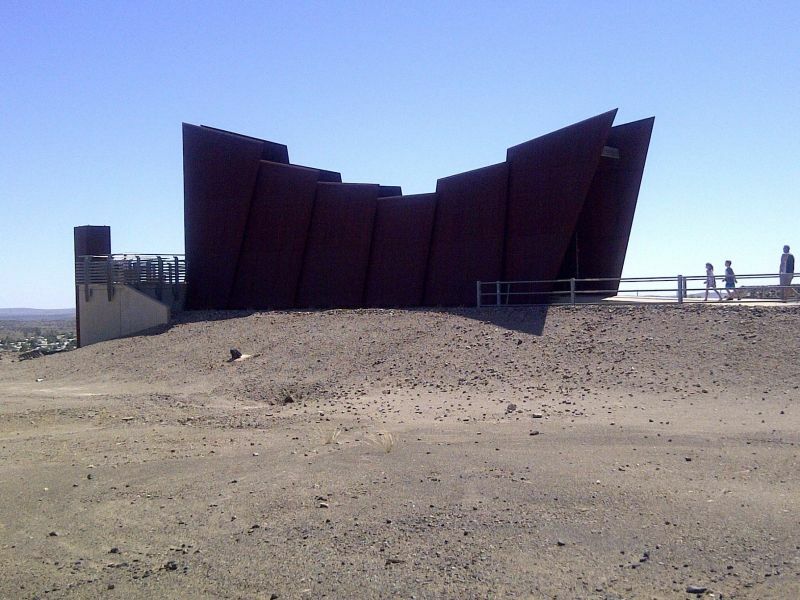 Carapellotti and Giobbi are buried next to each other in Broken Hill. Also Gino Giobbi and Carapellotti are buried next to their dad, both these boys died the at same time. My brother-in-law from a brain tumor. The other guy was out west with his motor bike, and hit a tree and was killed. They found him after 3 weeks. Mario Carapellotti. I knew the family. Mario Carapellotti had a stroke and never recovered, that is all I know. Gina lived not far from where we were in Melbourne, both her and her husband passed on. They had a son and daughter. The old lady Carapellotti was in a home towards the end, but she got out, and they found her dead a few days later. I have no dates. That is all I know. If you let me know what you would like, I will see what I can find. Its long time ago. We know a lot about Maria delTondo's family and the information will be in my family tree. We don't know the parents of Giuseppe Carapellotti. Can you help us with any more information?